The Butterfly Chiminea is a unique outdoor fireplace design with the excellent qualities of cast aluminum alloy construction. Requires very little maintenance and is made to last for years of use. The deluxe 7 piece set of ceramic logs provide the enjoyment of an outdoor fireplace, with the convenience of gas operation. The deluxe ceramic fire logs glow when heated similar to an actual fire and can be positioned individually according to your personal preference. 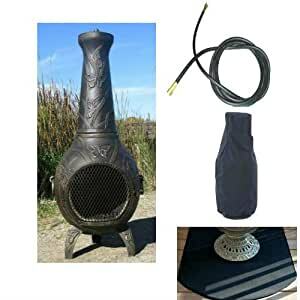 The chiminea can be converted to a wood burning fireplace by removing the gas components and converted back again by simple installation. Propane and Natural gas not recommended for outdoor cooking. Contact your local gas company for natural gas installations, propane installations can hook directly to propane tank or grill. Assembled Weight: 85 lbs.Shipping Weight: 88.00 lbs.